VERIFY In the book of John, we are blessed with many details that are not available from the other three accounts of Jesus. One time John, who was baptizing, saw Jesus and said “Look, the Lamb of God, who takes away the sin of the world” [Jn 1:29]. Two of John’s apprentices who heard this begin following Jesus. One of them was named Andrew, who then told his brother Simon “We have found the Messiah!” The Hebrew word “Messiah” means the same as the Greek word “Christ” [Jn 1:41 CE]. Andrew then took Simon to Jesus. Jesus looked at him and said, “YOUR NAME IS SIMON SON OF JOHN, BUT YOU WILL BE CALLED CEPHAS.” (This is the same as Peter and means “a rock.”) [Jn 1:42 GN]. Note: Matthew also recorded Jesus renaming Peter [Mt 16:17-18]. Remember Peter became one of Jesus’ main apprentices. Remember God, who guided Jesus on what to “SAY” [Jn 12:49], renamed Jacob, “ISRAEL” [Ge 32:28]. Occasionally people will claim God has renamed them. It is good to verify such claims with God. 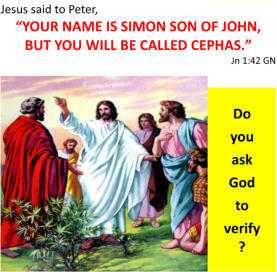 Do you ask God to verify?